The fog lifted on the “Road to WrestleMania” after Sunday night despite a WWE Fastlane pay-per-view that left much to be desired. In possibly the most disappointing pay-per-view card since WWE’s most recent brand extension last July, Goldberg capped off a head-scratching night of finishes by pinning Kevin Owens in 22 seconds to become the third WWE universal champion. The victory also raised Goldberg’s in-ring time to a combined 5:07 in three matches, including his initial return at Survivor Series against Brock Lesnar and follow-up appearance at the Royal Rumble. Putting the title on the line in Goldberg’s rematch with Lesnar at WrestleMania certainly adds prestige to a marquee match with crossover appeal. But one has to question the worth of the means it took to get there. The rumors of Goldberg’s sudden victory, which have swirled for months online, did nothing to soften the impact of how much seeing him with the belt threatened both the credibility of the title and Owens’ 188-day reign, which began one week after inaugural champion Finn Balor relinquished the belt due to injury after winning it at SummerSlam. Sadly, the Goldberg-Owens booking decision on Sunday was one of just a handful that left viewers taking to social media with disdain. Both Charlotte Flair’s 16-match PPV singles unbeaten streak and Braun Strowman’s 18-month unbeatable build came crashing down on an in-between PPV that didn’t appear to warrant such headlines. Fastlane also suffered from the fallout of what happens when your main event is less than 30 seconds long. A pair of last-minute (and meaningless) matches were added that only bogged down the show, making it feel much more like an episode of Raw. The night wasn’t without a few highlights, including Neville’s spectacular cruiserweight title defense against Jack Gallagher and Samoa Joe’s physical dismantling of Sami Zayn. But the bad far outweighed the good on this night. The WWE’s television structure quite often allows for the sins on Sunday night to be fully repaired 24 hours later with a big reveal on Raw. This week, for all we know, that may be the case. But even though Sunday’s results likely did a lot to connect the dots in WWE’s larger plan that is currently unseen, the ho-hum show failed to leave a satisfied audience so close to WrestleMania. Rich Swann & Akira Tozawa def. The Brian Kendrick & Noam Dar via pinfall in 9:25 (Kickoff Show): A pair of individual cruiserweight feuds were combined in this high-energy tag team match. Early on, Dar’s girlfriend, Alicia Fox, used her body as a shield for the heel duo outside the ring and successfully prevented a tandem aerial spot from Swann and Tozawa. But the babyfaces would not be denied late in the match as, simultaneously, Tozawa landed a suicide dive as Swann flipped head-first over the top rope. Swann then cleared out the ring with a pair of super kicks and hit an incredible Phoenix Splash from the top rope, securing the pin and victory. Samoa Joe def. Sami Zayn via submission in 9:45: Joe’s main roster build as an unrepentant hitman continued with a dominant victory that ended when he put Zayn to sleep with the Coquina Clutch. Joe, making his WWE pay-per-view in-ring debut, was physically dominant throughout, quickly shutting down Zayn’s attempts at rallying with stiff comebacks. Zayn did well to play possum late in a spot that was well handled as he rolled up Joe for a two count moments after it appeared the referee might stop the match. But in the end, Joe put the proper bow on his showcase of destruction by mouthing the words, “I told you so,” to Zayn’s lifeless body. Raw Tag Team Championship -- Luke Gallows & Karl Anderson (c) def. Enzo Amore & Big Cass via pinfall to retain the titles in 8:40: After an inexplicable run of jobbing since first winning the tag team titles at the Royal Rumble in January, Gallows and Anderson finally received some sensible booking to match their menacing look. The heel duo spent the majority of the match beating down and cornering Amore in classic tag team style, including a running knee from Anderson that prevented a diving Amore from making the hot tag to Big Cass. Late in the match, Gallows saved a sure defeat by pulling Amore’s leg to break up a pin attempt following his Badaboomshakalaka splash. Gallows then came through once more during the finish. After Anderson landed a kick to the face on Amore and went for the pin near the ropes, Gallows assisted from outside the ring by knocking Amore’s exposed leg off the ropes at “two,” allowing the referee to count from three without noticing the break. Sasha Banks def. Nia Jax via pinfall in 8:15: Fresh off her one-sided loss to Jax, who dominated the meeting between the ladies at the Royal Rumble, Banks spent the majority of Sunday’s match repeating the same formula. Jax’s strong push as a believable monster continued, and Banks deserves plenty of credit for her ability to sell and put Jax over. Banks endured a torture rack, which she reversed into a front guillotine. She also survived being rag dolled by her hair as Jax yelled, “Who do you think you are, huh? !” But in the end, Banks survived to pull out a miraculous win. After Jax lifted her up for a Samoan Drop attempt, Banks flipped out and reversed it into a roll up, bridging her body secure the pinfall. During the kickoff show, Jinder Mahal told Raw general manager Mick Foley that he and Rusev were no longer a tag team. Foley decided that each would compete in singles action during the show and would decide between themselves who fought which opponent. Before the first match, Mahal and Rusev fought in the ring with Mahal tossing Rusev over the ringside barrier. Cesaro def. Jinder Mahal via pinfall in 8:20: This one quickly had popcorn match written all over it. Cesaro and Mahal fought evenly throughout a largely forgettable match in front of a silent crowd. Cesaro got hot late, connecting on his Swiss-1-9 swinging kick before drawing a two count following a cross body from the top rope. After Rusev distracted Mahal by staring him down from the announce table, Cesaro jumped in to set up a pop-up uppercut and earn the pin. After the match, Rusev delivered a beating to Mahal, including a running superkick to lay him out. The Big Show def. Rusev via pinfall in 8:45: In a second previously unannounced match that felt a lot more like an episode of Raw than a PPV, Big Show continued to build his stamina ahead of WrestleMania. The match was physical from the start as Big Show jumped Rusev and scored a handful of near falls. Rusev targeted Big Show’s left knee from there and used a trio of kicks to the face to finally get the giant to the ground. In the end, a trio of chokeslams left Rusev down and out in the corner. Big Show added a weak KO punch for good measure, despite the fact that Rusev already appeared to be knocked out, before going for the pin. Cruiserweight Championship -- Neville (c) def. Jack Gallagher via pinfall to retain the title in 12:10: Neville’s claim as the king of the cruiserweights once again held true, but it wasn’t realized without a grueling, physical fight. 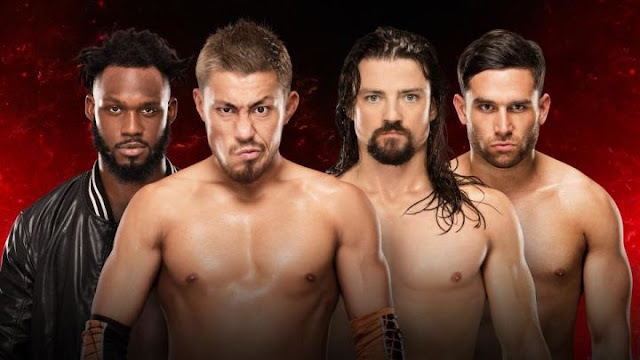 In what might be the division’s best match since the creation of the Cruiserweight Classic last summer, Neville needed the return of his Red Arrow finishing maneuver to finally put Gallagher away. Along with a number of stiff moves from both wrestlers, the match was full of high-flying spots. Gallagher landed a corkscrew suicide dive to the floor before connecting on a belly-to-back superplex that nearly earned a three-count. After throwing Gallagher into the ropes, Neville landed a snap German suplex that saw Gallagher land hard on his head. But a follow-up Phoenix Splash from Neville from the second rope only drew a two count. Neville survived a trio of head butts from a late-rallying Gallagher and countered a second superplex to set up the finish. Roman Reigns def. Braun Strowman via pinfall in 17:20: Strowman’s nearly two-year run as an unbreakable destroyer has come to an end. Despite elevating himself with his performance, which included a breathtaking missed splash from the top rope and an emphatic powerslam of Reigns through the announce table, Strowman suffered his first singles defeat by pinfall. The match was as physical as one might expect considering the exciting build heading in. Strowman showcased equal levels of strength and agility. He also received help from Reigns, who put over the big man’s resolve by looking incredulous after Strowman kicked out of a pin following a spear late in the match. In the end, the missed splash from Strowman softened him enough to be finished as Reigns landed a second spear to record the 1-2-3. For as much time and effort has been put into Strowman’s build, it was tough to see his run of dominance come to an end here so close to WrestleMania. Raw Women’s Championship -- Bayley (c) def. Charlotte Flair via pinfall to retain the title in 16:55: Flair’s unbeaten streak in PPV singles matches came to an end at 16 in a surprising finish. Banks, whose ringside interference helped Bayley to the title originally during a Feb. 13 episode of Raw, made her presence felt again. Banks’ run-in distracted Flair from attempting a moonsault onto the arena floor and continued briefly in the ring without a disqualification. Chasing Banks outside the ring, Flair was caught by Bayley, who hit her patented Bayley-to-Belly suplex at ringside. Back in the ring, Flair attempted to roll up Bayley for a pin but saw the attempt stopped by the referee after a screaming Banks pointed out that Flair had a handful of tights. Bayley answered immediately with another Bayley-to-Belly to score the pinfall in the middle of the ring. The match failed to generate buzz and showcased the lack of in-ring chemistry between Flair and Bayley, the latter of which kicked out from Flair’s moonsault and Natural Selection finisher. Ending Flair’s much-hyped streak was a head-scratcher, as was seeing Bayley benefit from heel booking once again. Universal Championship -- Goldberg def. Kevin Owens (c) via pinfall to win the title in 0:22: One spear. One Jackhammer. Goldberg, at 50, will enter WrestleMania 33 as the universal champion. Once again, Goldberg worked up more of a sweat during his iconic entrance than inside the ring as an appearance from Owens’ former best friend, Chris Jericho, was enough cost him the title. After delaying the start of the match trying to play mind games with Goldberg by rolling out of the ring three separate times, Owens finally jumped into the squared circle and demanded the bell be run. However, before that could officially happen, Jericho’s music hit and he walked out onto the stage, distracting Owens. As soon as the bell was run, Goldberg instantly attacked the distracted Owens and laid him out with a spear. Then came the Jackhammer and the 1-2-3. With the win, Goldberg became the second-oldest WWE world champion behind Vince McMahon (54). 0 Response to "WWE Fastlane 2017 results: Goldberg wrecks Owens in 22 seconds to win title"